On April 9 a training and information event was held on the project and the progress of the construction works of the new Pordenone hospital. The team formed by Pinearq, Steam (Padua, Italy), Studio Valle (Roma, Italy), and professionals Alessandro Taverriti, Ambrogio Aquilino and Gianfranco Moro, has been chosen to design the Morelli hospital extension in Reggio Calabria (south of Italy). Pinearq’s first participation at the d·HEALTH postgraduate course, led by Biocat within the Moebio Barcelona program, which focuses on innovation and entrepreneurship in the healthcare sector. The Architects' Association of Catalonia organized an event, on January 31, to learn about the details of the future Pediatric Cancer Center at the Sant Joan de Déu hospital. 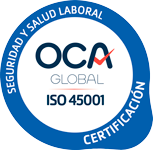 PINEARQ starts this year 2019 having accomplished a new certification cycle of its Integrated Management System, as it has been accredited by the OCA Instituto de Certificación, S.L.U. Josep Lluís Blázquez of Perspectiva, a Catalunya Ràdio program, interviewed Albert de Pineda about the new building for the Pediatric Cancer Center of Sant Joan de Déu hospital. Pordenone residents can see through two openings in one of the surrounding walls, at different heights and without restrictions, the progress of the works of the new hospital. On November 28, Nicola Paltrinieri - BIM Manager of Pinearq - participated as a speaker at the BIM Tour organized in Gijón by BIM Academy Spain, the City Council of Gijón and the Institute of Knowledge Transfer in Public Innovation (ITCIP). On October 16, Abraham Jiménez, responsible for Pinearq's innovation department, presented the project DIN2BIM Data Intelligence for Buildings at the fourth Internet of Things World Congress (IoTSWC). On October 18 we had the privilege of participating in the construction of the phrase For the brave with 100,000 pieces of Lego: an act that signifies the beginning of the works of the Pediatric Cancer Center at the Sant Joan de Déu hospital.